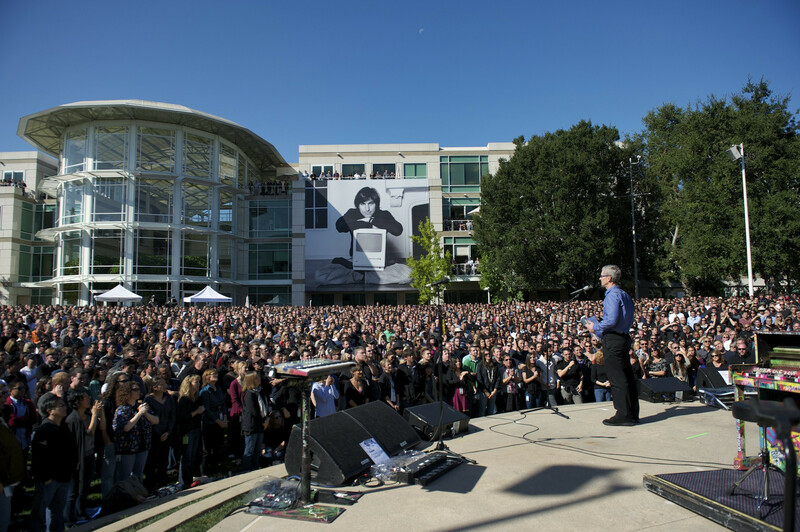 Photo & Video: Celebration of Steve Jobs’s Life – Cupertion HQ, Calif.
Apple on the its press site has just posted the picture of October 19, 2011 — Apple CEO Tim Cook speaks on stage to employees at a celebration of Steve Jobs’ life. In the video below, CNET, caught part of the event. Tim Cook, Bill Campbell and Al Gore spoke and Norah Jones and ColdPlay played music — ending with “You’ve Got a Friend in Me”. Apple retail employees shut down Store operations from 12-3 ET to view a private screening of the event.